This spacious seafront apartment is situated on the 7th Floor of the Rocklands Apartments facing unobstructed sea views. It offers excellent standard of holiday accommodation in Malta for travelers seeking high standard privately owned apartments on a self catering basis with superb location. All daily amenities are included including lift. Rocklands Apartments are located in the eastern part of Malta, in Sliema, just a few steps away from the rocky beach, city centre & St. Julians where one can find plenty of restaurants with different cuisine types and coffee shops. It is ideal for 1 or 2 week holiday breaks. Self drive cars can also be arranged and Cleaning can also be provided at an extra cost. A spacious seafront apartment measuring approximately 165 m² enjoying unobstructed sea views throughout. One can relax in the balcony and enjoy the various sailing boats and cruise ships passing by. The apartment has 3 bedrooms, 2 bathrooms one en-suite, fully equipped kitchen and large sitting dining room. The apartment enjoys very good natural light throughout since its on the 7th floor. The maisonette has 2 bathrooms, of which one of them is en suite. The apartment is very highly modern finished and suits everyone necessities. Internet usage is available at an extra charge and telephony can be used by purchasing pre-paid cards. Very nice appartments. Great location! During a week I stayed in the Sea view apartment together with 7 friends to celebrate our 'freedom' (our graduation of high school) and the apartment was just the perfect place! Each morning we woke up with an amazing view over the sea, which was across the street; so we took a few morning swims of course. The busstop is literally in front of the building and you can eat ice cream right next to the building! The sleeping sofa didn't under do for a bed. Also there's a lot of space, which is nice when you're with 8 people. The apartment has enough equipment, towels and whatsoever and the shower works excellent. There is also a working television and sofa's to chill on. Rosanne was very, very helpful and pleasant; she picked us up when we were lost and couldn't find the apartment, she made sure we had a taxibus for our way back to the airport in the middle of the night, she immediately sent someone when we had a little problem with the electricity, et cetera.. Conclusion: the location of the apartment, the apartment itself and Rosannes care were amazing! Thanks for having us, we had a great time in Malta! I travel quite a bit with my family and it's rare that I write a review. I'm doing so because my experience in Malta with Rosanne and this flat was so stellar. The location is prime, across the street from a beach and steps from many restaurants and markets. Mint is a fabulous cafe next door and across from a small produce market. We bought fresh fruit and veg every day! Around the corner is The Trading Post where one can find anything you need in a pinch. The supermarket is a few blocks up. The famous promenade is right in front of us, which leads us to St. Julians one way, Tigne Point - a beautiful shopping mall - and Sliema ferries and shopping area. The flat itself is modern, spacious, beautifully appointed and equipped. Rosanne welcomed us with information on how to get around (did I mention the bus stop is in front of the building, too?). She made herself available for anything we needed - but we had it all, so we didn't need to call her for a thing. And the view is simply stunning. We felt like we were on a cruise ship! If you go to Malta, I can't think of a better place to stay. I visit Malta quiet often however as this time we did a family reunion holiday we decided to rent an apartment. It was the best choice we could have made. 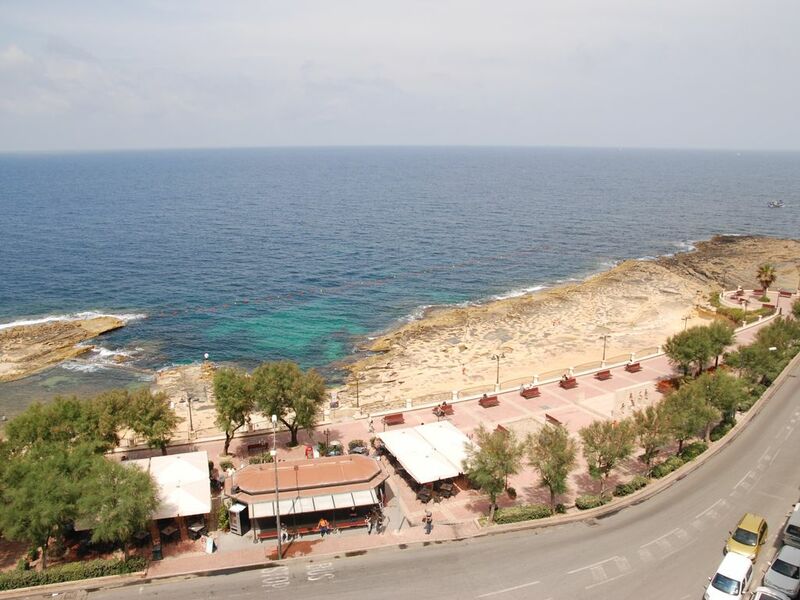 The apartment was perfectly located, the rocky beach right in front, only few minutes walk away from Sliema busy shopping area with many cafes and restaurants as well as only 10-15 min walking (or just a few min with the bus) to the busy Paceville area where the clubs and nightlife is. Right next to the apartment there is a fruit and vegetables store which also sell drinks and water and very close by were a few small supermarkets. Also right next to the apartment were two nice cafes/snack places and a block away a fantastic family run pizza/pasta restaurant... so dinning was easy and delicious! Overall I would recommend this apartment to anyone who is looking for a nice, carefree and relaxing holiday in Malta!!! My family with teenagers had a pleasant holiday in the Sliema Rocklands apartment in late September. The apartment was very spacious and had a balcony with nice view to the rocky beach across the street.The interior in apartment was nice and modern. Only downside was that there is no dishwasher in apartment. We liked the area and it was close to the Tigne Point shopping mall. It was also some restaurants in the area and it was nice to walk the sea side promenade both to the Sliema Strand side and the St. Julians Bay side. The rocky beach in front of the apartment was nice if you not need a sunbed. If you like to rent sunbeds it is possible 2 -3 minutes walk. There is a bus stop just outside the apartment. Easy access to Valetta. You can also take an old ferry betweenn Sliema and Valetta. I will reccomend this apartment to couples and families both with small children and teenagers. We enjoyed our stay very much in the apartment. It is very modern, clean and it has everything you need. It has also a small balcony with an outstanding view over the sea. The location of the apartment is great. There is a beautiful stone beach in front of the house. Also a bus station, a supermarket and an atm are near. Sliema is a busy town located on a peninsula with views of Valletta and Floriana on one side and the open sea on the other. It is located fairly centrally on the Eastern side of Malta. It is a great place to shop, enjoy the cafe culture and eat out. There are many hotels and apartments to let for those who like to be self-catering. It is also the place to catch the ferry to Valletta, buses to many places and also boat trips round the harbours and round the island. It is within walking distance of St Julians and Paceville where you find the best night life of the island, more restaurants and other places of entertainment. You will find examples of some of the traditional Maltese town houses and terraced houses if you take a stroll through the town. Sliema is a perfect place from which to explore St Julians, the Marina in Msida and to take a bus trip to Valletta, the capital city of Malta. Upon arrival at the property the sum of Eur500 has to be paid to over any breakages or damages that might occur at the property. These will be refunded back on the check out day. SPECIAL OFFERS FOR THE MONTHS OF SEPTEMBER AND OCTOBER! !